I've just uploaded a set of sprites that you can use in your Scratch projects to celebrate Red Nose Day, taking place Friday 15th March 2019. Red Nose Day is a UK charity drive that includes fundraising activities in the community and a telethon. Here's the background to this sprite pack: In 2015, a set of sprites was created for Red Nose Day, but the website that was distributing them is no longer online. I've posted them online again so that individuals and schools can use them in their Scratch projects this year and in the future. The sprite packs include cars, cartoon red noses (with some nice exploded nose special effect sprites), health sprites (including some cartoon bugs), and the heads of a number of family-friendly TV celebrities. You can donate to Comic Relief, the organisers of Red Nose Day, any time on their website. The charity supports vulnerable people in the UK and internationally. My book Mission Python went through extensive quality controls before publication, with each listing built and tested by both myself and the tech editor. My own testing was carried out on both the Raspberry Pi and the Windows PC. The points made above also apply to Listing 4-2: you should run it using pgzrun listing4-2.py and not IDLE. The game window will be blank. You can't use the shell to test the program, but you can add instructions to the end of the program and then run it from the command line. You will see the output in the command line window. Below is some example code to add to the end of Listing 4-2 to complete Training Mission #1 in Chapter 4. Add this code right at the end of the listing, without any indentation. When you've finished testing, make sure you delete this test code to avoid any problems later on. On p178, when you add the code from Listing 10-6 to Listing 10-5, you should save the program as listing10-6.py and run it with pgzrun listing10-6.py. The process and program still works if you reuse the listing10-5.py filename again as described in the book, but the correct process is to use listing10-6.py. If you experience difficulties, please see also my blog post about compatibility with different software and hardware platforms to those officially supported by Mission Python. Many thanks to Adriaan van Niekerk, Stéphanie Noardo, and Richard Park for telling me about these issues. If you encounter other problems, please feel free to get in touch. I've published a new 48-page PDF sampler of my novel Earworm, which you can download now. The sampler includes the first five chapters of the book, giving you a chance to meet the key characters. They include struggling musicians Thing and Fred, who have an opportunity to perform their music on TV, but only if Fred can ace a pop quiz. Dove and Creak have just come off stage in Berlin, and find that unresolved tensions create conflict backstage. Meanwhile, Jonathan is infiltrating Bigg Records, with a mysterious plan to save the music business. He'll have to blag his way into the building, and convince the marketing team that he's one of them. The book has received rave reviews from the music press, including from Metal Hammer who called it: "A fun novel about the problems faced by musicians in making their mark on a music industry that's falling apart. A bitter satire that works its way up to a memorable finale." Earworm is available in print and on Kindle at Amazon. It makes a great gift for a musician or music fan, or a fun holiday read if you want to treat yourself. Find more free chapters from my books here. Christmas is coming, so my Scratch advent calendar is once again open, sharing a new project or Scratch resource each day. Visit the calendar here! These all make great gifts for those who enjoy or would like to learn to program in Scratch. Follow the links above for more information on the books including free PDF samplers to give you a taste of the content. Be aware that there is a new version of Scratch launching in January, but the previous versions will continue to be available for download, and most projects should work seamlessly on the new platform. While we're in the festive spirit, let me tell you about a few other seasonal features on my site. I wrote a Secret Santa program for the Microbit, which you can see in my archive blog post here. You can play my Christmas version of Hangman, Snowman, here and play my Christmas Pairs game here. And Virtual Sean has his Santa suit on! Ho Ho Ho! Happy Christmas, everyone! If you're reading this, you probably know that my latest book is called Mission Python and it shows you how to build a space adventure game. I've added two new bonus resources to the website recently to help you to get the most from the book. First, there's an empty map template (PDF) which you can use to help you design your own game layout. I've also written an article with tips on customising the game code for your new map. There is a built-in maze generator on the page to inspire your designs too! Get tips and tools for customising the Escape game from Mission Python here. 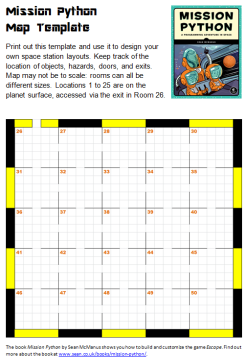 Secondly, in the spirit of all the truly great mags of the 1980s, there is a map of the space station (PDF) that you can use to find your way around, whether you're playing the game or customising it. When I was writing the book, I was mindful of spoiling the surprises by showing you all the cool images and room layouts we have created before you got to experience them in the game. So there are some room layouts shown in the map that haven't been previously published, even in the book screenshots. If you don't like spoilers, maybe play the game a bit before you check the map. For best results, download the PDF map and then zoom in to see each room more clearly. 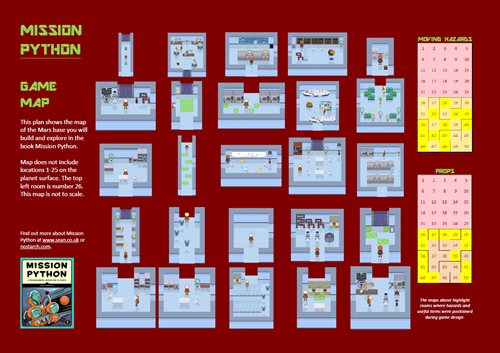 Find out more about the Mission Python space station map here. Mission Python is available now, and makes an ideal Christmas gift for readers aged 11+ who are interested in coding and want to really get under the skin of how a computer game works. Not sure whether it's for you? Check out the Mission Python free sampler here. 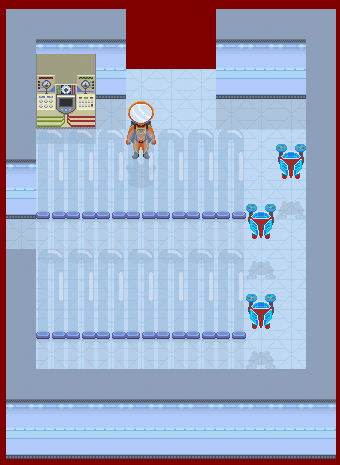 The game featured in my latest book, Mission Python, is called Escape and sees you solving puzzles to escape a space station on Mars where the air is slowly leaking away. The book advertises the game as working on the Raspberry Pi 3 and Raspberry Pi 2, and on Windows PCs, running Python 3.6. On these platforms, I was able to test both the build of the game and the play-through of the game to completion. The game should also work wherever Pygame Zero runs, but I haven't been able to test it everywhere. I set a high standard for accuracy and testing in my books, and only felt able to actively endorse the platforms we had thoroughly tested. Some readers have been in touch to ask about compatibility and pass on their advice for other readers. Here's a round-up of compatibility tips and tweaks. One of the screens you have to dash through in Mission Python. Does Escape from Mission Python work on the Mac? Yes! Othelo Vieira has kindly provided installation instructions for the software on his blog. David Weissman has also been in touch to confirm it's working "flawlessly" on his iMac. Many thanks to Othelo and David. Does Escape from Mission Python work on Ubuntu? Yes! Matt, also known as RaspberryPiSpy, is using Ubuntu 18 and had previously installed Python 3.6 and Pygame. He found he had to install Pygame Zero using pip3 install pgzero. To run the game he had to use python3 -m pgzero escape.py. Ian Brown confirms this approach using pip3 to install Pygame Zero but says you may hit permission problems, and recommends sudo pip3 install pgzero in that case. If you can't use sudo because your system is locked down, you can try pip3 install pgzero --user. Many thanks to Matt and Ian for testing and sharing their discoveries. Can you use Thonny with Mission Python? Yes! Reader Ian Brown says that to do so, you need to put import pgzrun at the very top of the code and then add pgzrun.go() at the very end. He is using Thonny on Ubuntu. Thank you, Ian! The book uses IDLE, and you might find it useful to stick with IDLE because the color coding will match the colors used in the book. Does the Mission Python game Escape work with Python 2? No, sorry. Pygame Zero is only available for Python 3. You can easily download and install Python 3. The instructions are in the book. Does the Mission Python game Escape work with Python 3.7? The book recommends Python 3.6 because at the time of writing, Pygame wasn't available for easy installation on Python 3.7. Charles G Smith Jr has been in touch to say he's got the game working on Python 3.7. He writes: "Good News. I was able to get your escape game up and running using version 3.7 of Python. Here is what I did to make your code work with the latest version. I added the import statement of import pgzrun at the top of the program, and I also added the statement pgzrun.go() at the bottom of your program." Many thanks to Charles. If you're less experienced with Python and/or don't already have it installed, I still recommend using Python 3.6 as described in the book to avoid the need to add extra code into all your listings. You can download Python 3.6 here. Does the Mission Python game Escape work on older Raspberry Pis? It doesn't crash, but it runs too slow to enjoy. It does need a Raspberry Pi 2 or Raspberry Pi 3 really. What screen resolution does the Escape game from Mission Python require? The game window has a height of 800 pixels, and I have been running it on a screen with a resolution of 1152x864 or higher. However, I did a quick edit to adjust the window height to 700 pixels so it can fit on a screen with a resolution of 1024x768. You may still need to hide the taskbar. You can download the smaller version of Escape here. You will need to rename the extension from .txt to .py, or paste the code into your code editor. The tallest room in the game is the third room you visit (West Corridor, room 37), so in this version I have taken the height down from 15 to 13 tiles, so it matches the next-largest room sizes. I have repositioned the toxic floor tiles within the new room to avoid them being too close to the bottom exit, which makes them unfairly hard to avoid. I have commented the lines that I changed in this program. Note that in the draw() function, the red box that is used to clear the game area must be resized to avoid overwriting the air and energy bars, and those bars must also be moved up in the AIR section of the program. Thank you to Ian and Ben Brown for identifying this issue. What about other compatibility questions? If you have any concerns, here's a low-risk way to test it works. You can download the free PDF sampler, which includes the installation instructions for Windows and Raspberry Pi together with instructions to get the game working, and you can download the final game code too. You can then test that the game works on your computer before buying the book. Thank you to everyone who has supported the book so far. I'm excited to see your reviews and customisations!